Detox products: Urine Cassette Drug Test for Amphetamine. Pass drug tests, passing all drug test. 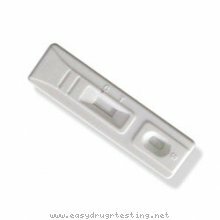 The one step AMP (Amphetamines) test is a simple one step immunochromatographic assay for the rapid, qualitative detection of AMP in urine. The amount of drugs and metabolites present in the urine cannot be estimated by the assay. The assay results distinguish positive from negative samples. A positive result indicates the sample contains AMP above the cut-off concentration. The AMP test provides only a preliminary analytical result. A more specific alternative chemical method must be used in order to obtain a confirmed analytical result. Gas chromatography / mass spectrometry (GC/MS) is the preferred method. Clinical consideration and professional judgment should be applied to any drug of abuse test result, particularly when preliminary positive results are used.